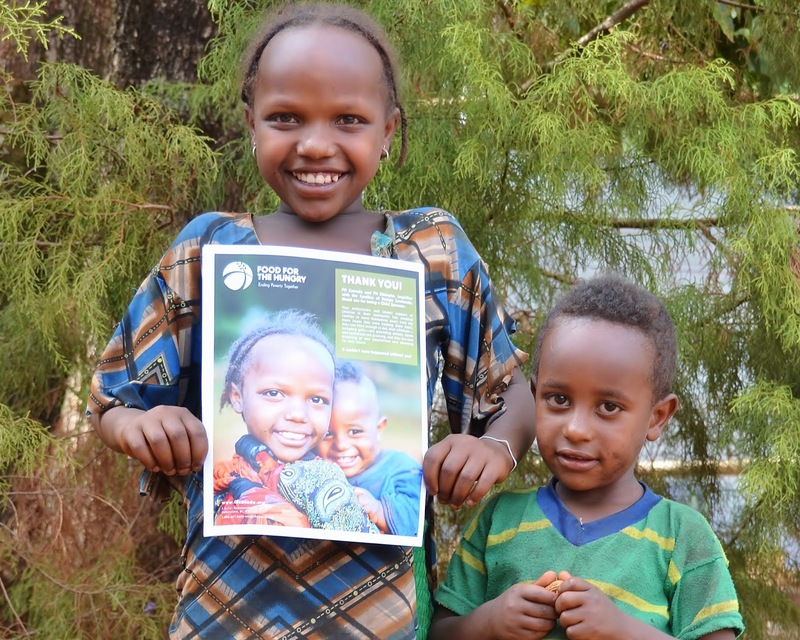 These two siblings starred in our Sasiga Lowlands Graduation Newsletter! They've grown a lot - and so has their community! In 2004, the Sasiga Lowlands communities began a development journey that touched the hearts of thousands of Canadians. For 12 years, partners all across the country walked with the families and children of Sasiga—businesses like Fifth Avenue Club in Calgary and churches like Lambrick Park in Victoria, BC; hundreds of Child Sponsors and Gift Guide donors; thousands of Run for Water enthusiasts and generous Canadians. This year, the Lowlands communities reached their development goals and completed their FH programing—they graduated! Without personally visiting Sasiga, it’s hard to imagine the scale of transformation that’s taken place. But by zeroing in on a few individuals, like Letera Degu, we hope you can begin to trace a picture of the all-encompassing transformation that donors like you sparked in these nine kebeles. Sometimes you meet a person who surprises you. Someone who has real vision for the future, an ambition to make each day count, a hunger to change the world. Letera Degu is one of those people. From all appearances, he’s just your average farmer with a big family. But as you listen to his story it quickly becomes apparent that he’s anything but average. Letera is a man on a mission. He’s an innovator, a risk taker, a true leader. Letera brandishes two papayas from his orchard. Twelve years ago, Letera and his family, like many families in the rural farming community of Sasiga, were only eating one or two meals a day. His wife spent hours every week combing the brush for miles in search of firewood. His children laboured to collect water from contaminated sources, and often missed school. Letera's own land was decimated by termites; he worked as a day labourer on a large state farm. Unfortunately, a day labourer’s wage wasn’t actually enough to live on; Letera’s family was stuck between a rock and a hard place with little hope of change on the horizon. But Letera is no average man; he was always on the lookout for a new opportunity. In 2004 FH Ethiopia began a relationship with the communities of the Sasiga Lowlands. Letera was first in line to join every program he could. As a farmer he was most interested in agricultural training. He and other farmers took workshops on biointensive farming, agricultural diversification, compost preparation, postharvest storage, resource management, and environmental protection. Along with these trainings, FH provided durable seeds, new technology, and new farm tools to give the eager trainees a boost as they headed back to the fields to try out their new techniques. Letera set out with determination. 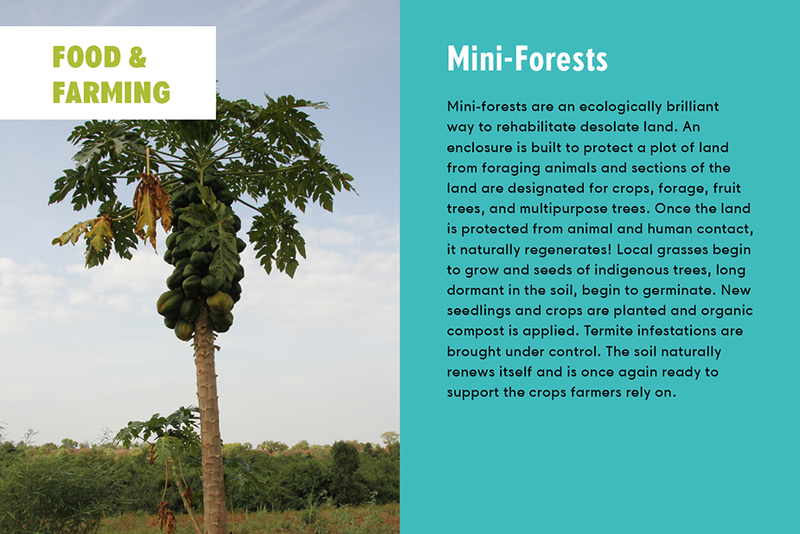 He started a tree nursery with the idea of developing a mini-forest. In doing so, he could rehabilitate infertile land, and have a renewable source of fuel and construction materials. He was the first person in his community to plant seedlings on his own land. Always looking for ways to expand his success to others, Letera donated many of his seedlings to a local elementary school in Milki Gudina. The school yard was tranformed from a bare wasteland into a shaded oasis. At that time much of the soil in Sasiga was barren, largely due to a massive termite infestation. Armed with new techniques to battle these devastating pests, Letera attacked the problem from a new angle by using tree planting, watershed management, and rich compost. He changed the actual ecology of the land and got the termites under control, opening up acres of arable farmland ripe for the planting. Some of the trees Letera planted in his mini-forest were fruit trees that produced huge bunches of bananas, papayas, avocados, and pineapples. He branched out into vegetable farming, cultivating tomatoes, beetroots, carrots, onions, and more. His kids could finally eat their fruits and veggies! Not only that, Letera was growing enough to regularly sell bundles of fresh produce in the local market, making money to purchase other food items his family needed. But Letera wasn’t satisfied with just subsisting. He’s an ambitious man who had caught a vision. He became the first farmer in his village to grow coffee. Then he added sugarcane and ground nuts—all cash crops he had never grown before. 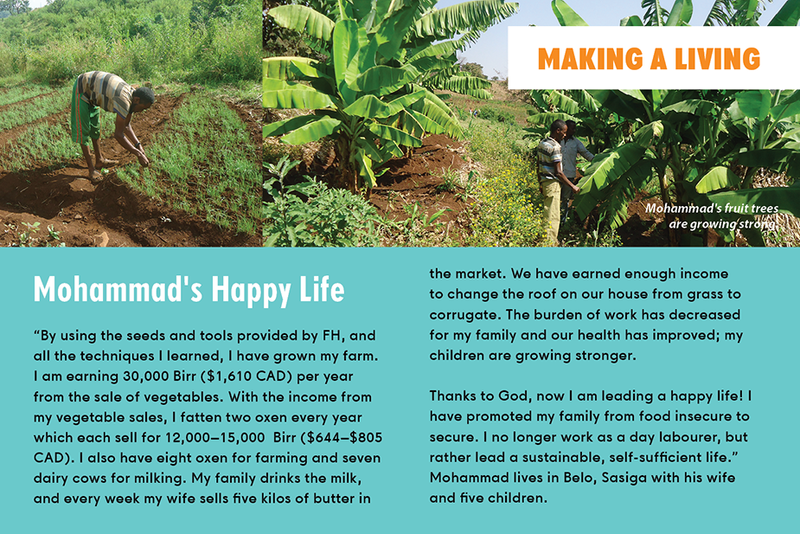 His income exploded, and the financial management training he’d received from FH helped him make the most of it. He began earning a yearly average of 30,000 Birr ($1,610 CAD) from coffee, vegetables, and fruit; and 20,000 Birr ($1,073 CAD) from ground nuts—a total sum of 50,000 Birr ($2,683 CAD) every year. Cattle produce dairy products and fertilizer, and serve as draught power for farmers. The impact of this wild success on Letera’s family has been the heart of his motivation. 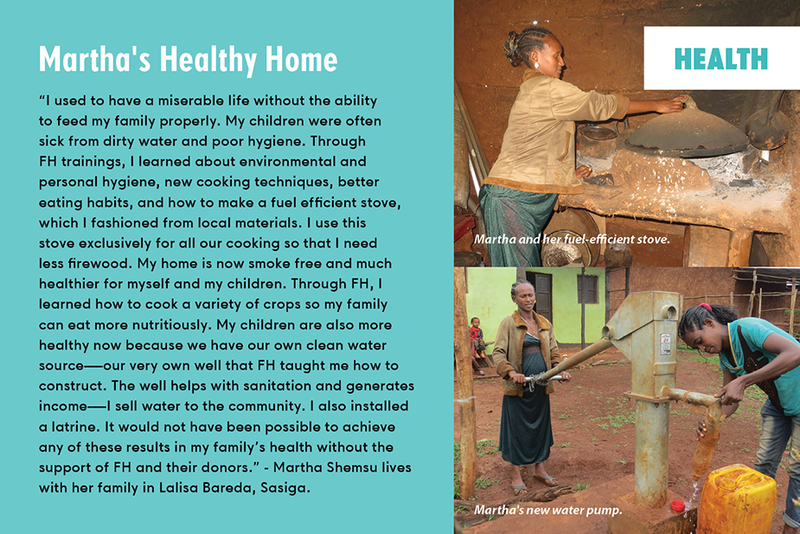 Instead of feeling hungry every day, Letera’s five children are now food secure—they eat a balanced diet and have enough to fill their little tummies. They’re well dressed and all attend school. Letera can go to sleep at night with a smile on his face knowing the most precious thing in his life—his children—have what they need to thrive. In addition to agricultural training, Letera and his wife attended workshops on family planning, sanitation and hygiene, potable water management, fuel efficient stove construction, and household management—all of which helped them raise their quality of life and gain more control over their health and future. While Letera is happy with the exciting results of all his hard work, he’s not content with simply a new status quo. He’s still dreaming of bigger things, of a future where everyone in his community, not just himself, experiences dramatic transformation. Letera plans to expand his business, both in livestock and crop production, so that he can support others as well as his family. He intends to promote organic agriculture and environmental rehabilitation to transform agriculture in Sasiga. To accomplish this, he’ll need to access larger outside markets, so he’s saving up to buy a vehicle to transport goods to market, as well as a tractor to begin the transition from hand farming to mechanised farming. Letera has a vision. And his dream is to share it. As a “model farmer” Letera already hosts farmers from other kebeles who come to observe his techniques in order to implement them at home. Letera is now teaching the principles of biointensive farming that changed his own fields from barren to fertile, sharing his experiences and supporting fellow farmers with good seed and sound technical advice. “And then the world.” That says it all. Letera Degu is a man of vision, a man with his eye on not just his community, but on the whole world. He may come from an average, rural farming community in eastern Ethiopia, but Letera Degu is anything but average. So look out world, he’s a man on a mission, and he’s out to change everything.